On 13th of September the Urban Design Section, Faculty of Architecture and The Built Environment will host a public debate with international and Dutch experts to discuss the potential spatial changes autonomous cars may bring in cities and what they mean for the current urban issues. Three sub-sessions will provide a forum for multidisciplinary debate involving relevant research and urban projects that outline and explore the possibilities opened by autonomous cars in relation to current urban sustainability goals. This session provides an overview of autonomous cars and urban implications from a spatial and transport planning perspective, by looking at different scale levels, backcasting and forecasting to observe automated mobility futures. David Hamers from the Netherlands Environmental Assessment Agency (PBL), lecturer at the Design Academy Eindhoven will present scenarios that deal with the main urbanisation and mobility issues in the Netherlands towards 2050. Dominic Stead, associate professor in spatial planning at TU Delft will talk about accessibility and active travel in the context of automated mobility. 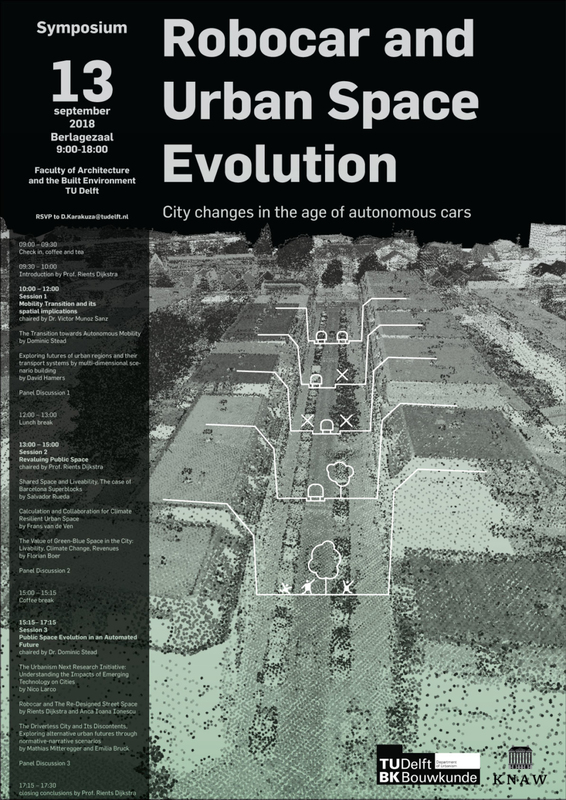 Rients Dijkstra and Anca Ioana Ionescu (TU Delft) will address the relation between autonomous cars and urban design. Beyond the theme of autonomous cars, desirable futures are already on the agenda of many cities which are trying to cope with the current urban issues through sustainable approaches and emerging urbanism projects. Salvador Rueda, author of Superblocks project in Barcelona (director of BCN Ecologia, IaaC), Frans van de Ven (TU Delft, Deltares) author of the Adaptation Suport Tool (AST) and Florian Boer (De Urbanisten), inventor of the ‘water square’ concept will talk about their visionary projects, aimed to enhance liveability, environmental quality, and climate responsive design in public space. Robocars can significantly redesign the urban environment. They promise to behave differently from the car as we know it and could facilitate accessibility and urban development anew. For instance, at the neighbourhood and street level, the use and perception of streetscapes can utterly change if parking space is freed up and streets are slowed down. Urban design groups from TU Vienna (Avenue 21), University of Oregon (Urbanism Next) will present methods and ideas to grasp urban futures in the context of automated mobility. More about the program and the event here.